Look at what was in my mailbox last night? I was so excited to see it! My E-mailbox that is! 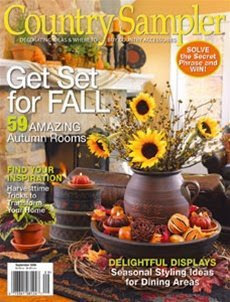 Some of my friends around the country have their new issues of Country Sampler, and they are raving about the fall photos. Mine is always one of the last ones to arrive, stateside that is. So until my issue arrives, I will feed my prim home fix by going to the galleries of great primitive homes over in the Members Gallery on A Primitive Place. That site gets better and better. New homes are being shown, new gatherings and displays, and the forum is wonderful. The gals are so sweet and so kind and supportive. There are RAK groups, swaps, even prayer chains - IF you choose to participate. If not, you can just enjoy sharing ideas and inspiration about decorating. The next issue of real Country Sampler looks like this one below. 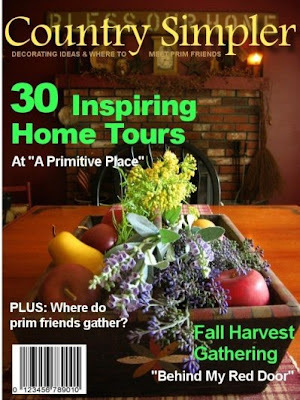 Our blogging friend Anne, over at Seasons of the Past, has a hooked wool runner that is featured on the cover! Woohoo! Congrats Anne! One of the things I love about blogging and belonging to prim communities is that I have met so many gals who love this style of decorating too and many have been published in one way or another, or have their own small business. It is amazing how we have so many common threads! In fact, our friend Jen over at Talyors*Farmhouse* Attic is having her photo shoot with Country Sampler today! Good luck Jen - I know it will be great! So you are now wondering - what does this have anything to do with Whatcha Working on Wednesday, right? I am getting there ... I promise! You see, just looking at that cover makes me crave the fall. It is no secret how much I just love the fall. In addition to the cool weather and foliage, it is so much fun to decorate with all the natural things that shout fall. And our home is really suited well for the fall decor. As a matter of fact, when Esther and Franklin Schmidt were here one year ago this week for my Country Sampler photo shoot, they said that many times. Esther walked in and exclaimed that this was one of the most autumnal homes she had ever been in and it should have been an Autumnal photo shoot. My stomach did a flip flop when she said that (several times) because I couldn't agree more and that would have truly made it even more wonderful. 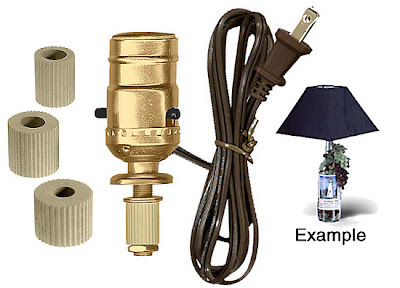 ... even more importantly, I found this Bottle Lamp Kit from National Art Craft online. This is exactly what I have seen in primitive shops. You can click on the name to get to the site to order them. 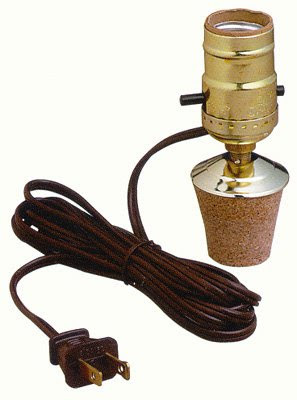 There is no wiring needed - just pop the appropriately sized rubber gasket into your jug, and viola, an instant lamp! Of course the most important thing we did all week was to babysit a few times for this little Angel... Liliana has brought us more joy than we ever imagined. We have a date with her on Friday night too. Remember when you were in high school and babysitting on a Friday night meant you had no date (oh no!) or nothing better to do? Well now, in this most wonderful season of my life, I can't think of anything I would rather do than spend time with my DH, babysitting for our little darling. Back when DH WAS my Friday night date in high school I don't think either of us could have imagined how amazing it is being grandparents to this darling little girl. It's a good thing! Make sure you stop on over at Leslie's to see the other gals who have posted for Whatcha Working On Wednesday as well! 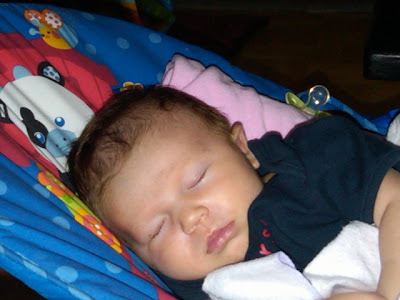 Now for some minor bloggy business... I almost typed soggy. We are back to rain rain rain this week. Soggy is an understatement! Never fear, I am not going to change my decor to Pottery Barn, or the likes. I simply meant that I am trying to be realistic about what this house can and will look like in the future. Sorry if I scared some of you into thinking otherwise. Not that there is anything wrong with Pottery Barn. It just isn't me. Nope, I do not live in Maine. No biggy - I love Maine - it's a beautiful state. I just don't live there. That would be ME. I live in MA. :-) And that's a good thing too!